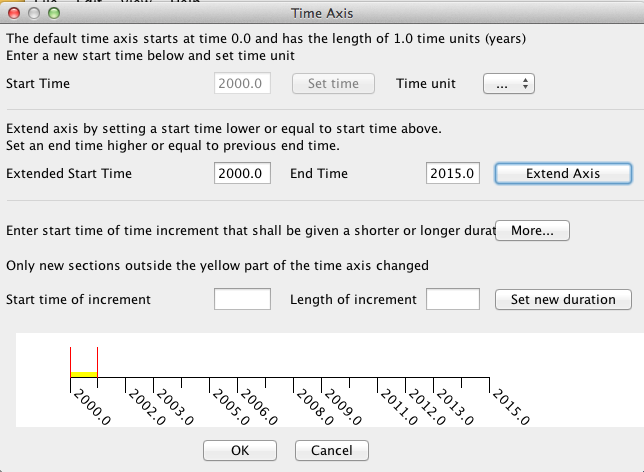 A time axis defines the time in the graph of the time course. This is done by the following steps. Enter the start time and press Set time. Unit of time has no meaning (just in this version) and is assumed to be years. Put end time (End Time) at the end of the last time interval, in this case the end of 2014 = 2015. Press Extend Axis. The end result can be seen below. The figure shows the time axis to be used for time course.